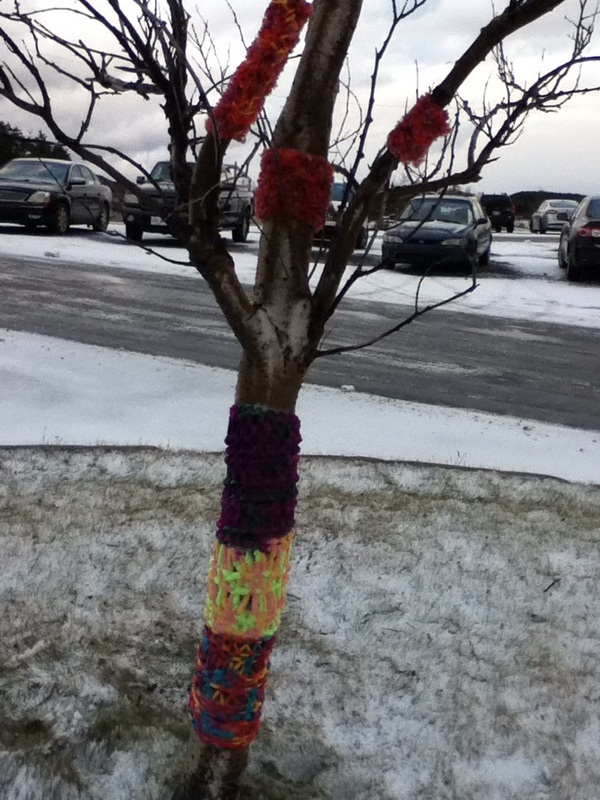 This knitted adenture began in the fall of 2014, when I read Craftivism, by Betsy Greer and made my first official Yarnbomb. It was a bit pitiful but it ignited joy in my belly each time I passed it. 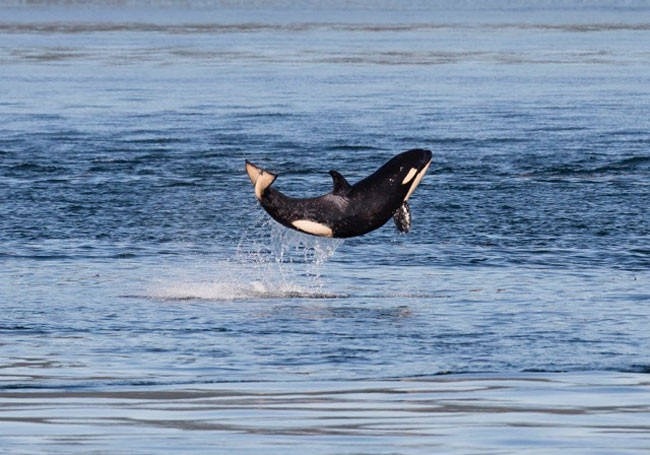 This feeling of joy, sprinkled with a very tame bit of mischief, was something I was craving. I had a handful of people approach me that first week, asking whether I was the one responsible for the tree, to this day I don’t know how they knew but they did, and the sparkle I saw in their eyes was undeniable. Initially I denied everything, and savoured the experience of orchestrating a small town mystery. Rumours flew- was the flower vine at the post office to celebrate the post masters marriage? Would the hospital administrators really allow a deadly knitted snake at the entrance of the health centre to remain? Would the mayor approve of all this? I kept knitting and being crafty and the more I did, the more I opened my eyes to the community. I started to see where people gathered and hear what their frustrations were, like potholes. As a result, I started to wake up to the great communicative potential of street art and the inherently inoffensive nature of craft and knitting. 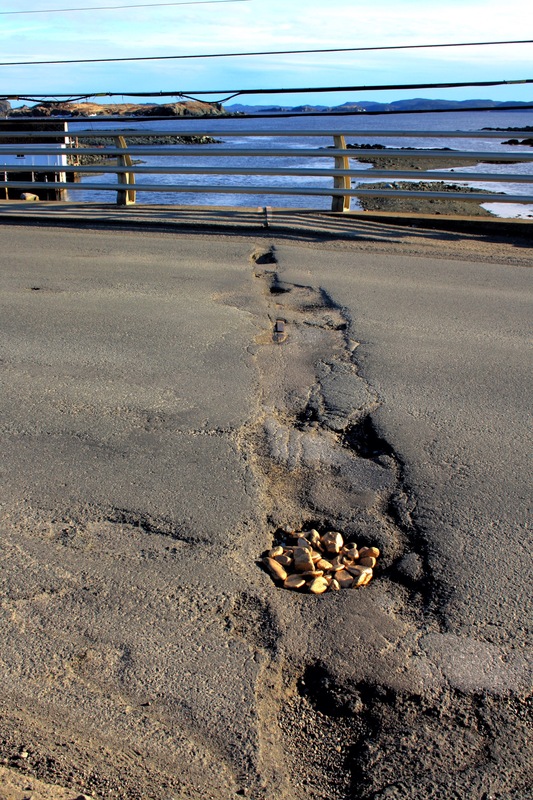 The main issue threatening the community was much graver than potholes though, Twillingate’s Life force was at risk. A ship, the Manolis L, containing almost 500 tons of oil had sunk thirty years prior off the nearby coast and despite local reports of oil patches, no effort had been made by the Canadian government to remove the vessel. Cofferdams had been installed but these were believed to be leaking as oiled birds had washed ashore. Concern over the sunken ship and the subsequent impact of a more serious leak was rising across the province. A friend organizing a local force inspired me to get involved and as a result, Old Manolis and the Sea was born. Old Manolis and the Sea was the catalyst for the opening of the Rock Vandals registry, and was one of two big projects launched at the Knit and Yoga retreat. 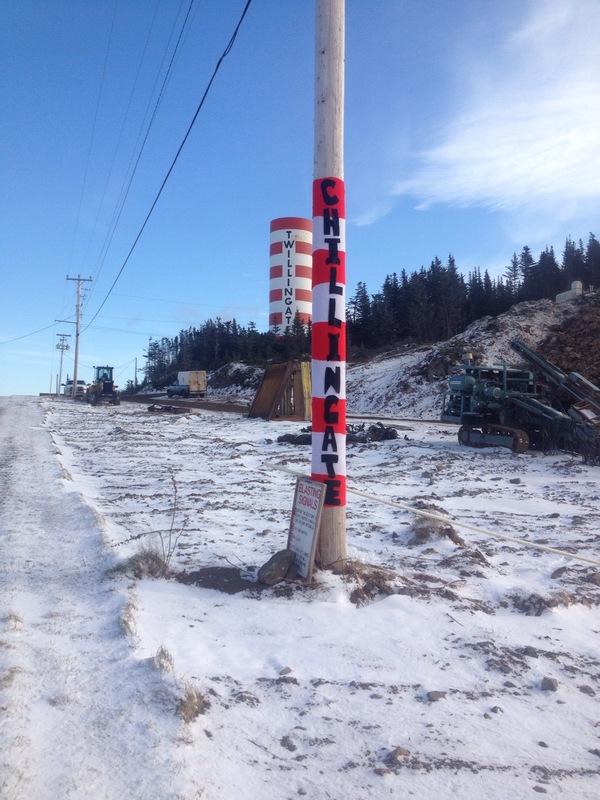 The first project, Old Manolis and the Sea came together through the effort of 11 women who contributed their time and skill to knit and crochet starfish for the main causeway in Twillingate. 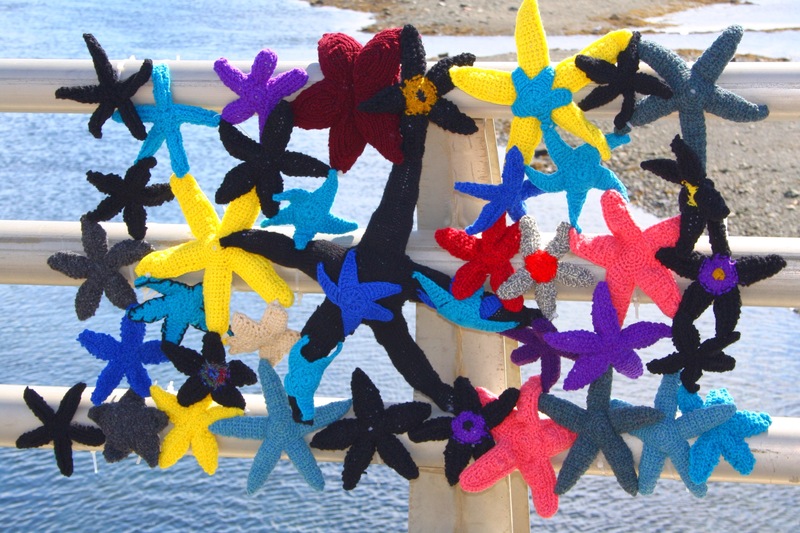 The project used black, amongst acquatic coloured starfish to represent the potential environmental impact of an oil leak from the Manolis L. On World Ocean Day in 2015, I installed 40 woollen starfish on Twillingates Tickle Bridge, the main thoroughfare in town. Word of the project spread enabling a second installation in the provincial capital of St. John’s. 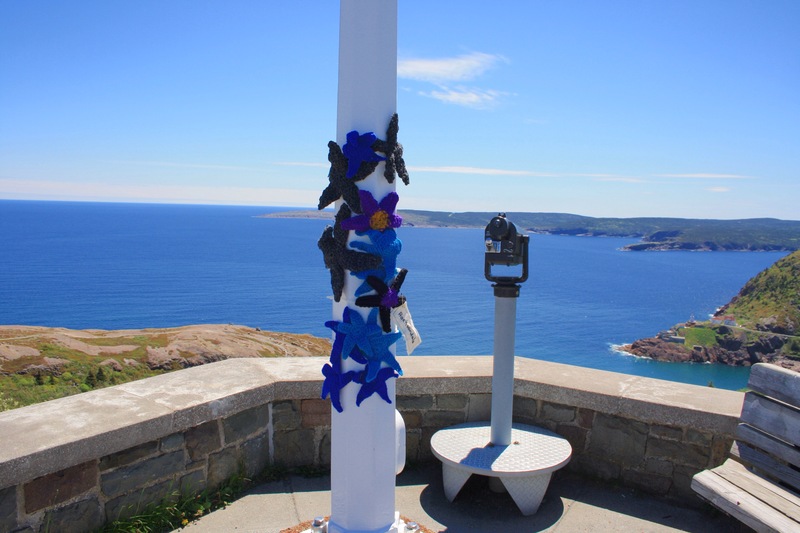 Word spread even further and a New Brunwick based artist got involved, creating a zine, and knitting and abandoning a starfish (and zine) at the Aquarium du Quebec. By now kind government officials had removed the St. John’s installation and returned it to me so I had enough starfish for a third installation! With help from Mo Wren, the artist, we arranged for a third installation riverside in the national capital of Ottawa. Our second big project was Chillingate. This project was completed by 5 different women who knit and donated panels to me, which I assembled and installed just as winter was rearing its head. The main intention of Chillingate was to bring a bit of fun and colour to the long dark days ahead. This puppy was 10 ft tall and each coloured panel took atleast 5 hours to make- this is highly committed gang activity! Since Chillingate I have been backpacking through South East Asia and yarnbombing solo-style, leaving knitting in each country I visit, which now includes Thailand, Malaysia and Laos. For the past eight weeks I have been studying yoga in Koh Phangan, Thailand and have been feeling increasingly inspired to use my knitted street art to promote wellness and positive mental states. This series is relatively new but the topic is vast, so I am anticipating it will be a journey itself. If you can believe it, yacking about knitting, craftivism and street art is a big passion, so if you share my enthusiasm you gotta let me know! I’de also love to hear you yarn on about where your knitting has taken you over the years in the comment section below. Enjoyed reading about your development as a craftivist! Very inspiring! Hey Nancy, it’s wicked to hear from you and thanks! Wow, this post speaks to me in so many ways! So glad I stumbled across your blog :). I am also traveling through SE Asia with a yarn stash, although I have yet to try out yarnbombing (it is on my list of things to try though). Can’t wait to read more of your adventures. Hi Susanne, great to hear from you and it’s very cool that you are nearby with a yarn stash too! 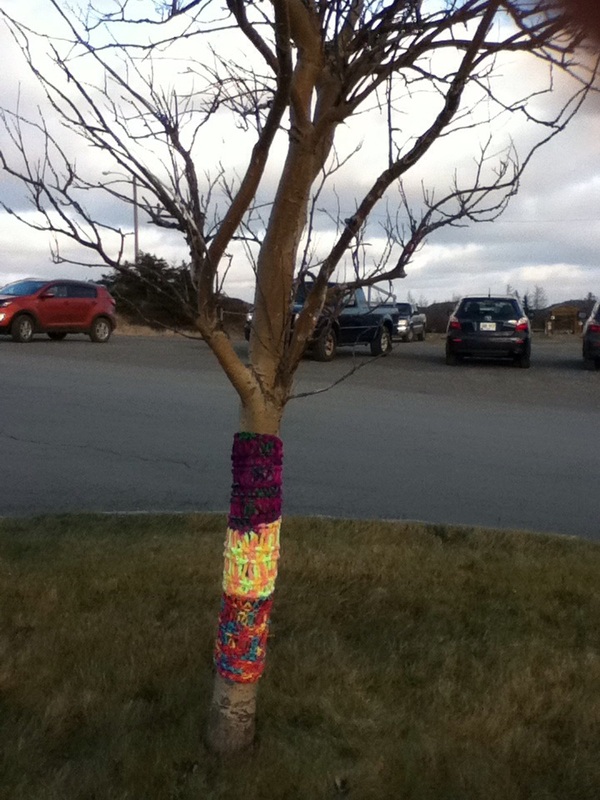 If you ever need a nudge towards yarnbombing def get in touch: I’de love to hear from you. Safe travels.